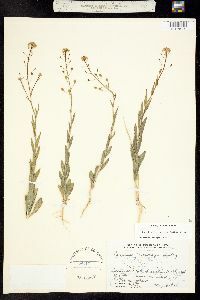 Camelina microcarpa Andrz. ex DC. Annuals. Stems unbranched or branched distally, (0.8-)2-8 (-10) dm, densely to moderately hirsute basally, trichomes simple, to 2.5 mm, often mixed branched ones, (glabrescent distally). 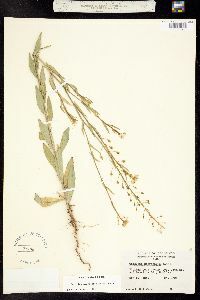 Basal leaves withered by anthesis. Cauline leaves: blade lanceolate, narrowly oblong, or linear-lanceolate, (0.8-)1.5-5.5(-7) cm × 1-10(-20) mm, base sagittate or minutely auriculate, margins entire or, rarely, remotely denticulate, (often subciliate), apex acute, surfaces pubescent, trichomes primarily simple. Fruiting pedicels ascending, 4-14(-17) mm. Flowers: sepals 2-3.5 × 0.5-1 mm; petals pale yellow, (2.5-) 3-4(-6) × 1-2 mm; filaments 1.5-3 mm; anthers ca. 0.5 mm. Fruits pyriform to narrowly so, 3.5-5(-7) × 2-4(-5) mm, apex acute; valves each often with obscure midvein, margin narrowly winged; style 1-3.5 mm. Seeds reddish brown or brown, 0.8-1.4(-1.5) × 0.5-0.6 mm. 2n = 40. Flowering May-Jul. Farms, fields, meadows, prairies, roadsides, forest margins, open woods; 0-2500 m; introduced; Alta., B.C., Man., N.B., Nfld. and Labr., N.W.T., N.S., Nunavut, Ont., P.E.I., Que., Sask., Yukon; Ala., Ariz., Calif., Colo., Conn., Del., D.C., Idaho, Ill., Ind., Iowa, Kans., Ky., La., Maine, Md., Mass., Mich., Minn., Mo., Mont., Nebr., Nev., N.H., N.J., N.Mex., N.Y., N.C., N.Dak., Ohio, Okla., Oreg., Pa., R.I., S.Dak., Tenn., Tex., Utah, Vt., Va., Wash., W.Va., Wis., Wyo. ; Europe; Asia; n Africa; introduced also in South America. 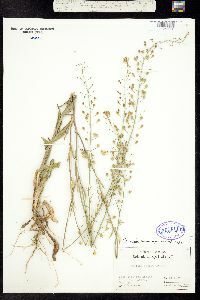 Annual herb 30 cm - 0.7 m tall Stem: upright, densely covered with simple and star-shaped grayish hairs (mainly on lower part). Flowers: in loosely branched clusters, pale yellow, 4 - 5 mm long, 1.2 mm wide at apex. Petals four. Stamens six. Fruit: a pod, on 4 - 9 mm long stalks, upright, 2.5 - 5 mm long, to 4 mm wide, nearly round but slightly flattened, keeled, with a beak up to 2 mm long. Seeds reddish brown, about 1 mm long, oblong, triangular in cross-section, smooth, slightly glossy. 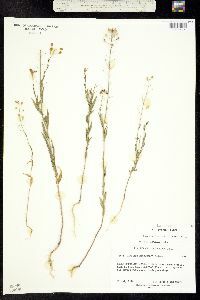 Lower leaves: alternate, 5 - 6 cm long, 1.5 - 2 cm wide, oblong, densely covered with simple and star-shaped grayish hairs. 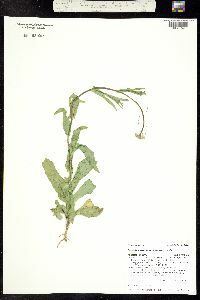 Upper leaves: alternate, stalkless, clasping, smaller than lower leaves (progressively reducing in size), lance-shaped, base lobed (typically pointed), sometimes with a few small teeth along the margins near the tip, hairy. 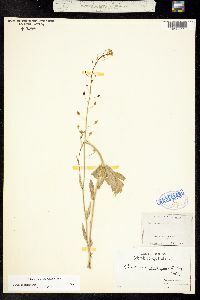 Similar species: The similar Camelina sativa bears larger fruit. Habitat and ecology: Introduced from Europe. 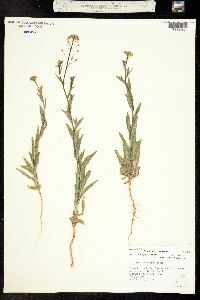 An infrequent weed of cultivated fields, waste ground, and roadsides. It is also found in nursery plots, sandy fields, and along railroads. Notes: This plant is best viewed when the sky is overcast, because the flowers close and shrivel on sunny, warm days. Etymology: Camelina comes from the Greek words camai, meaning dwarf, and linon, meaning flax (the term "dwarf" being used to mean "false"). Microcarpa means small-fruited. 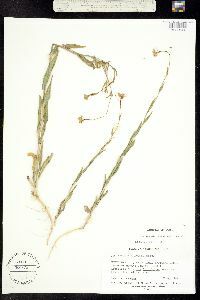 This species is essentially a sandy ballast plant and is more or less frequent throughout the state. I have found it also along sandy roadsides and in sandy, fallow fields where I once found it as an abundant weed. Erect, 3-7 dm, rough-hairy; lvs entire or remotely denticulate; frs erect, 2.5-5 mm, obscurely rugulose, on pedicels 4-9 mm; seeds ca 1 mm; 2n=40. Fields and waste places, usually in sandy soil; native of the Old World, established as a casual weed throughout most of the U.S. and s. Can. Apr.-June.